small, large 18(19.5) inches around cuff. Garter stitch is stretchy so these sizes will fit heads from child to large adult. I have made hundreds of hats over the years for my family and charity projects. This pattern is based on my basic recipe for hats. The nice, thick garter stitch band helps to block the wind and keep your ears snug in the coldest of weather. 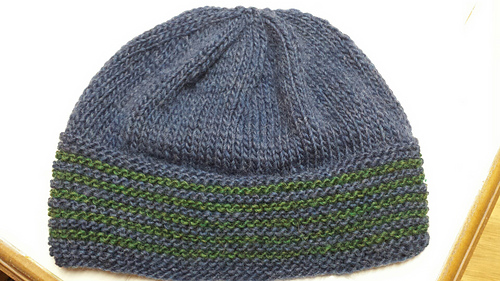 The top is shaped to make a smooth fitting beanie. 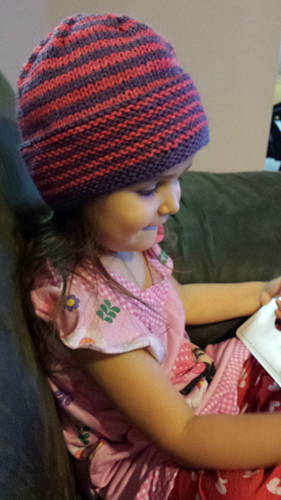 This is a quick knit so you can knit up several for your family, friends and favorite charity! The matching mittens or fingerless mitts in the companion patterns will keep your hands toasty as well. All three pieces can be made from two skeins of the main color and one skein of contrast.